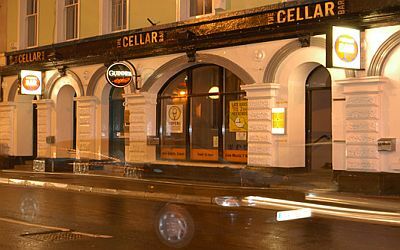 The Cellar bar is a staple of the Galway Pub scene being made up of the ground level main bar and the downstairs venue & sports bar. Although ownership has changed over the years the premises has continued to be a popular venue offering good value food and lively nightlife. The emphasis is on good Pub food served in generous portions including great value daily two course specials. The menu covers most appetites from big meals to snacks and sandwiches. The bar area itself is really comfortable with a mixture of cafe style seats and comfortable couches. Large windows look out onto Eglington street and Brown Thomas. At night the main bar plays host to a wide range of music such as open mic nights. There are also regular comedy nights and its worth dropping in during the day to check out whats happening at night. Going back to the 1970's the Cellar was a hotbed of music with Irish artists such as Frankie Gavin and Mickey Finn playing here. The Jazz Club at the Cellar Underground. Downstairs the 200 capacity venue has recently been used as a sports bar with the addition of 2 - 60 inch tv screens.